As you know I love to test everything that is even slightly related to lashes. I think it arise from short and unattractive lashes complex. At any cost I would want to make my look more expressive, but as for now I can achieve it only with false lashes. 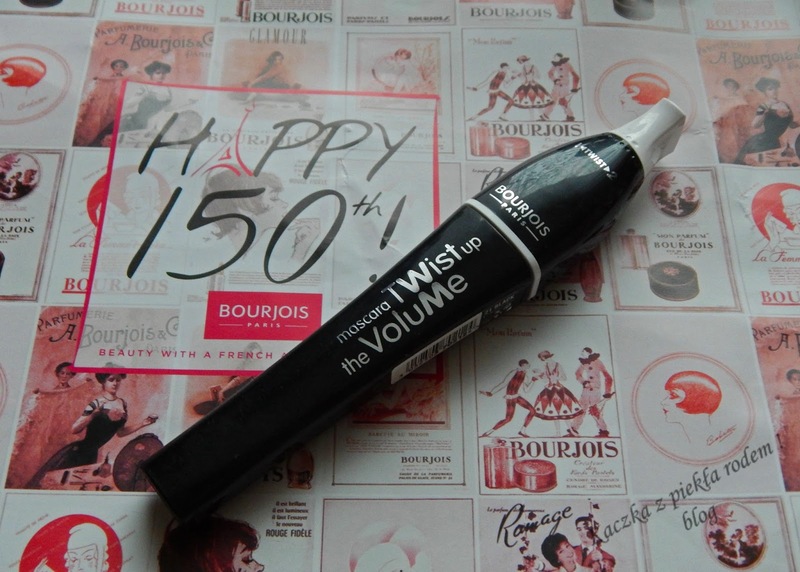 Lately, I get to test of new mascara from Bourjois (my favourite brand) – Twist Up The Volume. Twist Up The Volume is available in two variants – waterproof and standard. I, of course, chose waterproof, because of outside work, so I have to be prepared for all the weather conditions. Besides, my eyes very often water for no reason, so my mascara has to be extra long lasting. Why I get tempted by mascara from Bourjois? Firstly, this is my favourite cosmetic brand, so I trust it. Secondly, I still search for perfect mascara. Thirdly, Twist Up The Volume is an original mascara that I couldn’t say no to. Twist Up The Volume innovation is based on use of applicator with mechanism, which changes bristle position and makes possible achieving two different effects. In normal position brush ensures extreme length and after twist the mechanism tightens bristle and brush gives lashes full volume. How does it work in reality? Honestly, it depends. I do not like mascaras with too runny texture. I prefer much thicker mascaras, which won’t run down my lashes, because they dry immediately. Maybe it is a matter of me being unable to use this mascara, but Twist Up The Volume makes smudges on the lower eyelid and in eye corners. Very annoying! The effect also isn’t as magnificent as you may think. On my short lashes it gaves maybe a millimetre or two of length, not so impressive. A bit better is with Twist Up The Volume in case of thickening, because they truly became more expressive and gained volume. On one side it is a merit of pitch black colour, because the colour alone works miracles. I can’t deny that mascara from Bourjois gives full volume – even to my fine lashes. As a plus side I can also add durability, because once the mascara dries on lashes there is no way for it to flake, break or smudge till the end of the day. Black or blue eyelashes? Which to choose this summer? Why do I use only L’Oreal Volume Million Lashes?